Inside Americas gateway to the universe. Leading the world in preparing and launching missions to Earth and beyond. 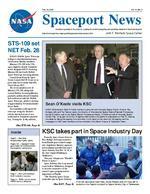 Feb. 22, 2002John F. Kennedy Space Center Spaceport Newshttp://www-pao.ksc.nasa.gov/kscpao/snews/snewstoc.htmVol. 41, No. 4 Page 3  New Web Broadcasting Facility opens. Pages 4-5  Spaceport News goes inside the Instrumentation Development Laboratories. STS-109 set NET Feb. 28 Sean OKeefe visits KSCNASA Administrator Sean OKeefe (center) is pictured with Kennedy Space Center Director Roy Bridges (left) and Tip Talone (right), the director of International Space Station/Payload Processing, during OKeefes visit to the Space Station Processing Facility. OKeefe arrived at Kennedy Space Center Feb. 14 as part of his tour of agency field centers. He spoke to employees on Feb.15, sharing his ideas for taking the agency to a new level. A full report on his vision for the agency and his messages to KSC team members will be included in the March 8 issue of Spaceport News .KSC takes part in Space Industry DayKennedy Space Center Director Roy Bridges and representatives from Florida space-related companies, legislative districts, agencies and academia attended this years Space Industry Day Feb. 12-13, at the State Capitol Building in Tallahassee. This years theme was Floridas Future is Space. Space Industry Day is an annual event held in Tallahassee designed to increase awareness of the nations space program and its importance in Florida. The Kennedy Space Center team takes part in Space Industry (See DAY, Page 6) NASAs Hubble Space Telescope will get a scheduled maintenance visit from its Earthly caretakers. Mission STS-109 is the 27th space flight for Shuttle Columbia and is designated HST Servicing Mission 3B, the fourth Hubble Space T elescope Servicing mission. Launch from Kennedy Space Center Launch Pad 39-A was set at press time for no earlier than Feb. 28 at 6:48 a.m. EST. The seven-member crew of Mission STS-109, along with several Hubble Servicing Mission payloads, will fly aboard Columbia and rendezvous with the Hubble Space T elescope, which is orbiting at approximately 314 nautical miles above Earth. Crew members will capture the telescope using the Shuttles robotic arm and secure it on a workstand in Columbias payload bay. During the 11-day mission, (See STS-109, Page 6)Page 7  First Latin American GAS Canister a success. Page 8  TDRS-I set for launch. HESSI launch a milestone.From left, astronauts Heidi Piper, Sunita Williams and Jim Voss talk to students in the Capitol courtyard for Space Industry Day in Tallahassee. SPACEPORT NEWS Feb. 22, 2002 Page 2 STS-109 Launch Honorees Awards Recognizing Our People Energy AwardSWE program encourages girlsThe Society of Women Engineers (SWE) Space Coast Section recently hosted a successful workshop for 4th to 8th grade girls at the Florida Solar Energy Center. More than 200 girls and 75 parents attended the Introduce a Girl to Engineering Workshop, which was aimed at sparking girls interest in engineering and other science-related fields. For many of the KSC employees and SWE members who volunteered, the turnout far exceeded their expectations. The high turnout for this event demonstrates the interest in these young girls and their parents in engineering and technical careers. I hope we have the resources to continue and expand this program in the future said Judy Kersey, retired NASA and SWE region D director. The all-day event featured several workshops where the girls worked on hands-on activities to learn about the different aspects of engineering. Many learned about electronics by making Bedroom Bugs, a miniature alarm system that can be used to let them know if anyone enters their bedroom. Others learned about aerospace and propulsion by making AlkaSeltzer Rockets. Civil engineering was introduced in a tasty way with Chocolate Asphalt, a process of assembling, mixing, and producing chocolate cookies in the same way that asphalt is produced for roads. The parents also received valuable information during a panel discussion from Zenaida Gonzalez, Florida Today education columnist; Joyce Henderson, science fair expert; and Mike ODonnell, author of Whats a Parent to Do? and founder of ParentingBiz. This day was packed with educational excellence, as students, parents, teachers and authors gathered to enjoy the excitement and fun of science and math applications, said Barbara Hoelscher, SWE career guidance chair and retired United Space Alliance employee. Susan Floyd, Boeing manager and SWE-SC president, was also pleased with the workshop. I was overwhelmed by the enthusiasm and excitement shown by the girls and their parents. Providing a wide variety of workshops, which included the younger girls, was key, she said. For more information on other SEW career guidance activities and ways that you can also volunteer to help, visit their Web site http:// www.spacecoast.net/spacecoast/ swe or contact Barbara Hoelscher at Barbara.hoelscher@swe.org.NASA was honored with a Presidential Award for Leadership in Federal Energy Management. Accepting the award for KSC was Wayne Thalasinos (second from left), KSC energy manager. Also pictured (from left) are Dan Goldin, former NASA administrator; Spencer Abraham, secretary of the U.S. Department of Energy; and Sean OKeefe, NASA administrator.Kenneth Bair Boeing Rocketdyne Power & Propulsion; Martha Bell NASA; Jackie Bevis Space Gateway Support; Jeffery Beyer NASA; Kimberly Boatright NASA; Chris Brannigan Boeing Human Space Flight & Exploration Payload & Carrier Programs; Thomas Brauer NASA; David Brink NASA; Samuel Brinton Boeing Payload & Carrier Programs; Stephen Bulloch NASA; Martha Carroll Comprehensive Health Services; Diane Cox United Space Alliance; John Czere USA; Daniel Dupuy Wyle Laboratories; Stephen Ernest NASA; Chip Everhart Boeing Payload & Carrier Programs; Donald Fahey USA; Douglas Farmer USA; James French Moog Space Products; Carolyn Friend USA; Mark Gentry USA; James Gershater Boeing Space Shuttle; Elwyn Grier Honeywell Technology Solution; Dicksy Hansen NASA; Silas Holder USA; Steven Horn NASA; Christopher Iannello NASA; Brandon Irlbeck USA; Steven Kelly SGS; George Klein USA; Tami Leutholtz Goodrich Universal Propulsion; Peter Markert ; GHG Corp.: George Odom USA; Michael Palmer USA; Fred Pearson USA; Alexander Riter Creative Management Technology; Mischele Scherf Dynacs; Steven Schindler NASA; Linda Serfozo USA; David Shaner SGS; James Sloan Boeing Payload & Carrier Programs; David Slaiman Lockheed Martin Space Operations; Gregory Smilek Boeing ISS; Steven Stover NASA; James Taffer Comprehensive Health Services; Susan Thai USA; Lisa Waters USA; Raymond Weyl Hamilton Sundstrand Missile, Space & Undersea Systems; Michael Williams USA; Willie Wise USAStanding from left, Linda Bradley of United Space Alliance, Kristen Kinder of Boeing-Rocketdyne and Traci Just, NASA, introduce girls to propulsion and rockets by helping the girls make Alka-Seltzer rockets. SPACEPORT NEWS Page 3 Feb. 22, 2002Web Broadcasting Facility onlineA ribbon cutting ceremony Feb. 11 marked the beginning of a new era in space coverage with the official opening of Kennedy Space Centers new Web Broadcasting Facility. The new facility, which incorporates a TV studio, will use live broadcasting via the World Wide Web and exclusive programming called KSC Direct to bring the public closer to KSC than ever before. Interested space enthusiasts from around the world will be able to follow launches, landings and other KSC events in a real-time environment. Adding to the excitement and educational value, an interactive chat feature will allow anyone watching to submit a question to be answered by featured experts. Dennis Armstrong, master of ceremonies and the projects manager, explained why he pursued the project. It became apparent that there is a new cyberspace frontier with a broad, international audience that is looking for real-time information. We wanted to meet the needs of that audience, and share the KSC story with them, Armstrong said. Located in the News Center at the KSC Press Site, the new facility fits with the current print and broadcast media operations. This new operation is complementary to our traditional information outlets, remarked Center Director Roy Bridges. Im proud that were getting on board with this new capability. Weve got some great material to share. District Director Brian ChaseFIRST competition to be held March 7-9attended on behalf of U.S. Congressman David Weldon, who expressed regret that he was unable to join the festivities but sent a congratulatory message to those who contributed to the project. JoAnn Morgan, KSCs Director of External Relations and Business Development, then took the podium to thank everyone who worked hard to ensure that the facility became a reality. Seventy people representing 30 different organizational units had a role in the success of the facility, from funding and construction to technical advice. In addition to NASA employees, several contractor groups contributed to the design, completion and operation of the project: InDyne, Inc., Johnson Controls, Northrop Grumman Information Technology, Photobition, Space Gateway Support and United Space Alliance. This cooperation and teamwork between NASA and its contractor teammates promise to create an informative and enjoyable product that will encourage online visitors to stay tuned.Dennis Armstrong, project manager; JoAnn Morgan, director of External Relations and Business Development; Roy Bridges, Center director; Vanessa Stromer, Information Technology Division; and Brian Chase, district director for Congressman Dave Weldon, who was unable to attend the ceremony cut the ribbon on KSCs Web Broadcasting Facility Feb. 11. What do Rocco bot, Combbat, Demolition Squad, Solid Orange Trojanotics, and Hybrid V igor have in common with NASAs Spaceport T echnology Center? Why robots of course! Hundreds of high school students from the U.S., including Puerto Rico, and Canada, will descend on Kennedy Space Center March 7-9 for the fourth FIRST (For Inspiration and Recognition of Science and Technology) Robotics Regional Competition to be held at the KSC Visitor Complex. Forty-seven teams of students and their mentors have signed on to the challenge and excitement of designing and building an original robot in just six weeks. The KSC Regional will be one of 17 regional competitions to be held in the United States and Canada. During the competitions, the robots will be directed to race around a playing field gathering balls, put the balls into goals and place the goals in their scoring zone  all in less than two minutes. The FIRST robotics competition is designed to provide students with a hands-on, inside look at engineering and other professional careers. The competition shows students that the technological fields hold many opportunities and that the basic concepts of science, math, engineering and invention are exciting and interesting. Many of the students who participate go on to study those fields in college and then pursue careers in aerospace. The FIRST Robotics Competition is not just about the design and building of sophisticated robots. These students also develop maturity professionalism, teamwork and mentoring skills that enrich their lives, said Dean Kamen, founder of FIRST. KSC Director Roy Bridges strongly endorses the FIRST Competion and its goals. We look to you, the students and mentors participating in this competition, as an investment in an exciting future. The skills and teamwork you develop for this competition are just what we need to assure that the future is all it can and will be, Center Director Roy Bridges states in his welcome letter to the participants. Practice rounds for the KSC Regional will begin on March 7 with qualifying matches on March 8 and elimination and final matches on March 9. NASA has teamed up with contractor organizations and community groups to fund and staff the regional event. Many volunteers, with both technical and non-technical backgrounds, are needed to make this happen. Drivers, crowd control and field attendants are among those needed. To volunteer, please contact Pat Christian at 867-2144 or e-mail her at patricia.christian 1@ ksc.nasa.gov. USA employees should contact Linda Bradley directly at 867-3709 or e-mail her at Linda.j.Bradley@usago.ksc.nasa.gov.The FIRST Competition shows students that the technological fields hold many opportunities and that the basic concepts of science, math, engineering and invention are exciting and interesting. Page 5 SPACEPORT NEWS Feb. 22, 2002 i on Development LaboratoriesDevelopment Contractor. For each project we try to pull together people who have the right expertise, Larson said. Its not a question of which specific instrumentation lab will do the work. Most of our projects require several areas of expertise. Areas of expertise include sensors, hazardous gas detection, chemical instrumentation and processes, data acquisition, lightning detection, optics, nondestructive evaluation, navigational systems and advanced range technology. Because we have a full range of skills in the labs, were able to quickly develop and test prototypes and immediately make modifications, said Jef f Ake, director of Instrumentation Systems for Dynacs. When members of the instrumentation group are called upon to solve an operational problem or to develop an instrument or sensor upgrade, they first look for a piece of off-the-shelf equipment, hoping to keep costs down, Ake said. If need be, team members will work with commercial manufacturers to modify equipment to meet program specifications. If no off-the-shelf equipment can be used, the group develops its own prototype instrument or sensor. The equipment may then be manufactured commercially. But if only a few pieces of equipment are needed, the instrumentation group may manufacture them, sometimes with the help of other groups at KSC, including machine shops. Our equipment oftentimes has to function in extreme environments, Larson said. We may need a pressure sensor to work in a flame trench. Most of the instrumentation groups development and testing work is done within laboratories within the Engineering Development Laboratory and the Operations and Checkout Building. After the instruments and sensors are verified and certified, other groups, such as United Space Alliance and Boeing, use the equipment.Steve Boyd of NASA explains changes made to the newly upgraded Microwave Scanning Beam Landing System Navaids chassis. John Gates of Dynacs demostrating the use of hydrogen fire detectors. Carl Hallberg of Dynacs demostrates the new Infrared Hydrogen Fire Detection Camera. John Randazzo of Dynacs performs simulation analysis of a high velocity wind sensor. f the new Shuttle Mobile Dr. Chris Immer and Dr. John Lane of Dynacs discuss digital image processing techniques to precisely measure relative positions of the Payload Ground Handling Mechanism (PGHM), which loads cargo into the Orbiter Payload Bay. Jose Perotti of NASA explains how a Valve Health Monitoring Sensor operates. ly Fitzpatrick of y nacs prepares uid standards for n Chromatography o rk while Jan u rma of Dynacs n alyzes Gas h romatography a ta from the oxygen o duction system. Feb. 22, 2002 SPACEPORT NEWS Page 6STS-109 ...(Continued from Page 1)DAY ...(Continued from Page 1) Watch out for seasons severe weatherDay because it is important to educate Floridians on the contributions and needs of the entire space sector across Florida, said JoAnn Morgan, director of External Relations and Business Development. We hope to keep our representatives aware of how the space program enhances the lives of Floridians through technology, research, education, and economic benefits. Our team included academia, space industry representatives from small and large companies around Florida, as well as state and USAF partners here at the Cape A fair sky in Florida can quickly turn into a hazardous one.JOHN MADURA KSC WEATHER OFFICE Tornado central! Hurricane express! Thunderstorm capital! Lightning alley! Florida has more than its share of weather hazards. But learning weather safety and keeping aware of the local weather will help Kennedy Space Center team members avoid weather death and injuries. With tornado season upon us, Cape Canaveral Spaceport meteorologists and safety officials suggest keeping a close eye on weather reports. Floridas strong tornado season slowly rises in February, peaks in late March, and then falls in April. The largest tornado outbreak in Florida history was in February of 1998. Dozens of people lost their lives in a single night. A fair sky in Florida can quickly turn into a hazardous one, said John Madura, who heads KSCs Weather Office. Thats especially dangerous for boaters who head out before checking to learn what weather conditions may develop based on current atmospheric conditions. Those who havent already prepared should now prepare for the late winter-spring strong tornado season. The seasons tornadoes often occur late at night, so warning sirens may sound late at night and might not be heard by sleepers. For better protection, purchase a NOAA weather radio that will sound an alarm in your home if the National W eather Service issues a warning for your area. Late winter-spring tornadoes are caused by strong cold fronts, so KSC team members should be wary when strong cold fronts are approaching the area. Know where to take shelter in your house. Secure small, light objects outside around your residence, including patio furniture, garbage cans, tree branches and bicycles. When the tornado hits, its too late to take these actions, so be prepared. The State of Florida held Florida Hazardous W eather Awareness Week-2002 Feb. 17-23 and created an educational Web site. To view the State of Florida site, visit www.floridadisaster.org/hwaw/ For daily weather forecasts and hazardous weather outlooks for the Spaceport, visit the 45th Weather Squadron Web site at https:// www.patrick.af.mil/45og/45ws/ index.htm. For weather hazards outside of the Cape Canaveral Spaceport, see the forecast from National Weather Service Melbourne at www.srh.noaa.gov/mlb For 45th Weather Squadron weather safety briefings, call 8538410. Lightning safety is their specialty. Lightning is the No. 1 weather killer in Florida, and inflicts lifelong severe injury on many more than it kills. Lightning season begins in May. National Lightning Safety W eek will be held April 28 through May 4. Canaveral Spaceport and other advocates. Numerous events and activities were scheduled during the event. NASA astronaut Jim Voss answered visiting students questions at the Astronaut Encounter in the Capitol Courtyard. Two traveling NASA trailer exhibits located in the courtyard in front of the Capitol Building were available for tours. The exhibits showcased the International Space Station and NASAs next-generation space transportation programs. The NASA Johnson Space Center International Space Station exhibit, two 48-foot trailers docked at a 90-degree angle, created a walk-through exhibit.Boaters and others heading out for recreational activities shouldnt be lured into complacency by a benign looking sky, as pictured above. Weather conditions can quickly change in Florida. Check forecasts to learn what weather conditions are brewing.four mission specialists will perform five scheduled spacewalks to complete system upgrades to the telescope. Primary tasks are to replace one of the telescopes four Reaction Wheel Assemblies, on Hubbles spacecraft equipment bay, and replace the Solar Array 2 currently on Hubble with the Solar Array 3. The assemblies are Hubbles primary steering mechanisms. The wheels stabilize and precisely point the telescope. The Solar Array 3 consists of four large flexible solar array panels that will provide power to the observatory. The new arrays are one-third smaller in size, more efficient and will help reduce the effects of atmospheric drag on the telescope. Additional upgrades include replacing Hubbles current Faint Object Camera with the Advanced Camera for Surveys (ACS). The ACS will have 10 to 20 times more discovery power than the camera it replaces, depending on the wavelength of light being observed. The ACS comprises three different cameras with specialized capabilities. The high-resolution camera will take extremely detailed pictures of the inner regions of galaxies and will search neighboring stars for planets. SPACEPORT NEWS Feb. 22, 2002 Page 7The first Latin American Get Away Special (GAS) canister flew aboard the Space Shuttle Endeavour on its last mission, STS-108. Pablo De Leon, the program manager representing the Argentine Association for Space Technology (AAST), recently visited Kennedy Space Center to retrieve the successful GAS can experiments. The experiments are now being analyzed by various AAST members. The association is a consortium of non-profit, university and private research institutes in Argentina. We are proud its the first Latin American payload, and were hoping it will encourage other research groups in Latin America to sponsor payload experiments, De Leon said. We had an extremely positive experience working with NASAs Goddard, Wallops and Kennedy representatives. AASTs seven experiments composed Paquete Ar gentino de Experimentos, or PADE, also known as the Argentine Experiments Package. Although other South American payloads have flown aboard the Shuttle in the past, PADE was the first 5-cubic-foot GAS can to be filled with experiments developed and sponsored by a South American organization.First Latin America GAS can a successPADE experiments included transport of fluids in non-circular tubing; surface vibration of water drops; migration of drops and bubbles in microgravity; exposure of seeds to space; crystal formation and growth in microgravity; maximum acceleration register; and geophysical fluids movement. The GAS can program  which is part of the Shuttle Small Payloads Project (SSPP)  was initiated in the mid-seventies to provide low cost access to space. A total of 157 GAS payloads have flown aboard the Shuttle since 1982. Goddard Space Flight Center manages the SSPP. The project team designs, develops, tests, integrates and flies small payload carrier systems for the Shuttle. The small payload carriers  GAS, the Hitchhiker, Space Experiment Module (SEM)  support payloads supplied by NASA, other US government agencies, universities, high schools, domestic commercial customers, and foreign nationals and governments. The carriers can support payloads that range in size from 50 pounds to 4000 pounds. The PADE experiment weighed about 60 pounds. The small carriers are integrated into the Shuttle depending on how much space is left over after primary payloads are taken into account. Dave Ward, acting field operations manager for Wallops Flight Center under the auspices of Goddard, managed the PADE project. The Argentines were a great bunch of people to work with, Ward said. I could tell the experiments meant a great deal to them. When the PADE GAS can was given the go ahead to fly on STS108, Vir ginia Whitehead, future payload manager at KSC, was assigned to facilitate the payload integration. She enlisted the Prototype Shop to help with a modification to the PADE payload, for example. Many of the organizations with small payloads have never flown a payload before and they need someone at KSC to point them in the right direction, Whitehead said. Its very rewarding work because they tend to be excited about their projects. Work on the PADE payload project began several years ago and was complicated by the distances between the NASA centers and Ar gentina, De Leon said. These GAS can experiments are a good start for us and we hope to do more. In the future, such efforts could lead to Space Station experiments, De Leon said. You have to start somewhere, and this was a good beginning.KSC selected for Discovery modificationsAfter completing detailed, independent cost and risk assessments, the agency has decided to perform Space Shuttle Orbiter Major Modifications (OMM) at Kennedy Space Center. Since the inception of the Space Shuttle program, the Palmdale Manufacturing Facility in California has served as the manufacturing site for all orbiters, in addition to the primary location for performing periodic maintenance and safety upgrades. However, beginning immediately with the Space Shuttle Discovery, which is scheduled for its periodic structural inspection and maintenance period in early spring, the work will be moved to KSC. NASA Headquarters Office of Space Flight made the decision following an extensive review. While it was determined that either KSC or Palmdale could support the current Shuttle launch schedule, keeping two modification facilities active to support four orbiters is no longer feasible in todays fiscal environment. Program managers believe significant infrastructure savings would be realized performing the major modifications in Florida. Shifting work to KSC would also minimize risk. This decision reflects NASAs primary goal of maintaining safety as its primary objective and then evaluating cost savings and risks associated with that decision, NASA Administrator Sean OKeefe said. It is obvious that in the current fiscal environment, it makes more sense to perform this work at the launch site for the foreseeable future. The decision was reached after evaluating site selection criteria established by the Office of Space Flight, which included cost and risk, manifest impacts, shuttle flight schedule, management and workforce skills and experience, major modification performance in the past and present, facility utilization and centralization of operations. Managers determined keeping both active to support four orbiters is no longer practical or feasible given the current Shuttle manifest and budget environment. Program managers believe significant infrastructure savings would be realized performing the major modifications in Florida.Above, Pablo De Leon, PADE program manager, explains experiment details to Michelle Turchet, NASA/Goddard quality inspector during processing at Kennedy Space Center. At left, the Argentine Experiment Package (lower righthand corner) is seen on orbit during the STS-108 mission. Page 8 SPACEPORT NEWS Feb. 22, 2002 John F. Kennedy Space Center Managing editor. . . . . . . . . . . . . . . . . . . Bruce Buckingham Editor. . . . . . . . . . . . . . . . . . . . . . . . . . Kathy Hagood Editorial support provided by InDyne Inc. Writers Group. NASA at KSC is located on the Internet at http://www.ksc.nasa.gov USGPO: 733-133/60002Spaceport News Spaceport News is an official publication of the Kennedy Space Center and is published on alternate Fridays by External Relations and Business Development in the interest of KSC civil service and contractor employees. Contributions are welcome and should be submitted two weeks before publication to the Media Services Branch, XAE-1. E-mail submissions can be sent to Katharine.Hagood-1@ksc.nasa.govVolunteer for All-American PicnicNASAS High Energy Solar Spectroscopic Imager (HESSI) lifted off at 2:29 p.m. EST Feb. 5 from Cape Canaveral Air Force Station. Tucked inside a Pegasus XL rocket, attached to the under belly of the Orbital Stargazer L-1011 aircraft, the spacecraft was carried approximately 113 nautical miles east-southeast of the Cape. The Pegasus drop occurred at 3:56 p.m. EST. After a short powered sequence, HESSI was delivered into a circular orbit. During its planned two-yearHESSI launch milestoneTDRS-I set for launch March 8This years All-American Picnic is scheduled March 16 from 10 a.m. to 3 p.m. Ray Lugo, executive director of Cape Canaveral Spaceport Management Office; Shannon Bartell, director Safety Health and Independent Assessement; and Mike Butchko, president of SGS, have teamed up as this year s chief organizers. The annual picnic will be held at KARS 1 and will have the traditional atmosphere. A few new twists have been added. Volunteers will be needed to support this activity, so contact the SGS PA Of fice, (321) 853-7061, or Peggy Parrish, (321) 476-4000, to volunteer. Tickets will be available at all NASA Exchange stores starting on March 1. Tickets for adults are $5 and $3.50 for children. The Tracking and Data Relay Satellite-I (TDRS-I) was set at press to be launched into geosynchronous-transfer orbit aboard a Lockheed Martin Atlas IIA rocket March 8. TDRS will be launched from Space Launch Complex 36 at Cape Canaveral Air Force S tation. The launch window extends from 5:39 to 6:19 p.m. EST. TDRS-I is the second in a new series of three Tracking and Data Relay Satellites designed to replenish the existing on-orbit fleet of six spacecraft, the first of which was launched in 1983. The Tracking and Data Relay Satellite System is the primary source of space-toground voice, data and telemetry for the Space Shuttle. It also provides communications with the International Space Station and scientific spacecraft in low-earth orbit such as the Hubble Space Telescope. This new advanced series of satellites will extend the availability of TDRS communications services until approximately 2017. This generation adds Ka-band capability to the TDRS fleet allowing for higher data rates using a more favorable and less heavily used frequency band. The first satellite in the current series, TDRSH, was launched in June 2000. TDRS-J, the third satellite, is planned for launch late this year. TDRS-I weighs 3,338 pounds, but at launch will weigh 7,031 pounds when fully fueled with its propellants consisting of monomethyl hydrazine fuel and nitrogen tetroxide oxidizer. The solar arrays when deployed will supply the spacecraft with up to 2,200 watts of power. The TDRS-I spacecraft is built for NASA by Boeing Satellite Systems of El Segundo, Calif. The TDRS project is managed by NASAs Goddard Space Flight Cente r, Greenbelt Md. Launch vehicle technical oversight, mission integration, and launch countdown management are managed by KSC. TDRS-I began its KSC processing at the Spacecraft Assembly and Encapsulation Facility-2 (SAEF-2) and was set to be transferred to the pad on Feb. 25. The on-orbit TDRS network will transmit data on the second Centaur upper stage burn and TDRS-I spacecraft separation.The Tracking and Data Relay Satellite-I rests on a workstand in the Spacecraft Assembly and Encapsulation Facility-2.mission HESSI will study the secrets of of how solar flares are produced in the Suns atmosphere. The HESSI mission was a milestone indicating the maturity and success of the ELV Program since being consolidated at KSC in October 1998. HESSI was the first all KSC ELV launch in that it was the first launch that KSC had total responsibililty, from the original acquisition through to launch, said Craig Whittaker, Small ELV project manager at Kennedy Space Center.Tucked inside a Pegasus XL rocket, attached to the under belly of the Orbital Stargazer L-1011 aircraft, the HESSI spacecraft lifts off from Cape Canaveral Air Force Station Feb. 5.